Homeownership and its pros and cons have been a topic of discussion for many years, there are tons of articles and posts going over and dissecting the advantages and the disadvantages of owning a home mostly focusing on the financial aspect of its benefit or lack off. But aside from the financial point of homeownership, there are other aspects of homeownership that can bring certain benefits not only to the homeowner but also to the communities they live in. 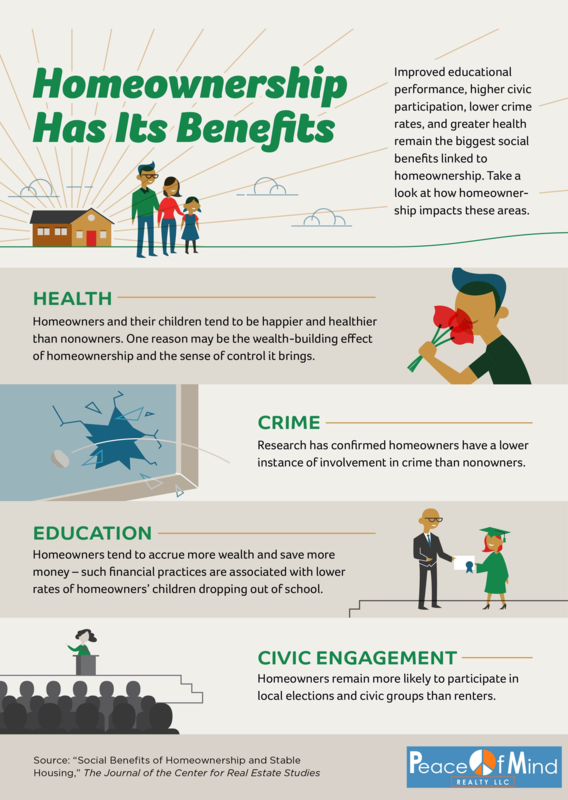 This short Homeownership Infographic summarizes some of those benefits including health, level of crime, education, and community engagement. There are always pros and cons in every decision we make, and homeownership is no different. The key is to evaluate and compare those pros and cons to your individual goals and objectives in order to help you determine staying on which side of the equation benefits you the most. We have helped many families in the DFW area to achieve their home ownership goals, if you are thinking about buying, or if you are a first time home buyer and are contemplating a home purchase, please contact us for a free consultation meeting to help you determine if homeownership is the best fit for you.